WebPageOz uses and highly recommends VIPRE Advanced Security. VIPRE products offer high-performance antivirus software that doesn't slow down your PC like older, traditional security products. VIPRE has been VB100 and ICSA certified, which means you get world-class protection. VIPRE Advanced Security combines the powers of an antivirus engine with antispyware protection and an advanced firewall all in one application, and now with Anti-Spam, Cloud-Enabled Security and Advance Active protection. Need more information prior to purchase? * Subscription can be cancelled at any time. This is for everyday discount outside the dates mentioned above. Please click an image below. and now with Anti-Spam, Cloud-Enabled Security and Advance Active protection. and IS NOT a resource hog. Note: The box is shown above is for illustration purposes only. Delivery is by electronic download after purchase. A CD is available for an extra charge at checkout. Remember to print or record your Product Key for future reference. VIPRE is the best protection against ransomware, viruses, Trojans and other online threats. Try VIPRE Advanced Security NOW! and also increase the number of years for your subscription. 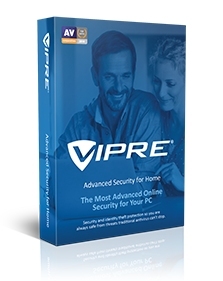 VIPRE PC Lifetime Licenses are available occasionally. 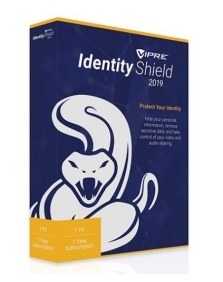 VIPRE Identity Shield protects your identity. It helps secure your information on your PC, ensures your privacy online, and blocks webcam and microphone snooping. Immediate alerting, real time protection and immediate resolution – all in one click. VIPRE Mobile Security Premium. 1 Year, 3 Devices for $19.99. emailed to you as well, together with your Product Key; so please use your actual email address during the purchase. A CD of the product is available as an option, for an additional charge. All the above sales/transactions are conducted through the VIPRE Antivirus secure server for your protection. Look at the number of ways to pay at the Checkout !